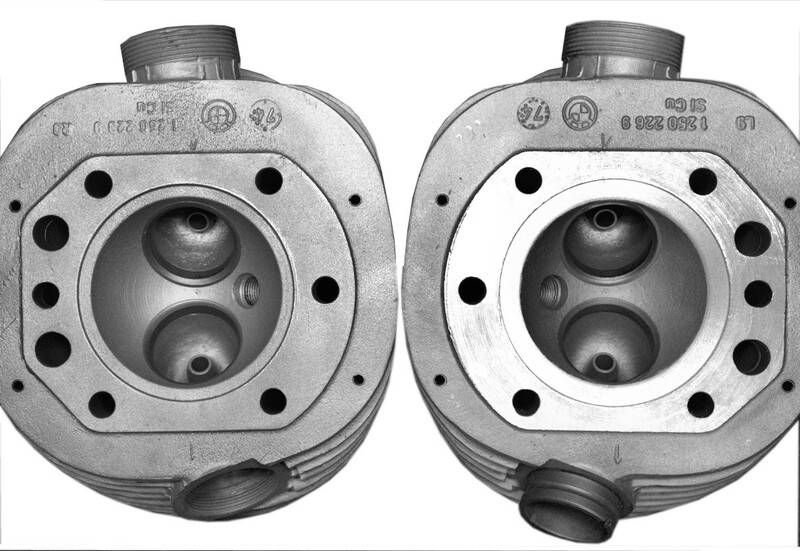 Skrunkwerks have partnered with Siebenrock to create power upgrade options that are more efficient than the standard, purely bolt-on kits that Siebenrock traditionally supply. ‘There’s no replacement for displacement’ as the saying goes. 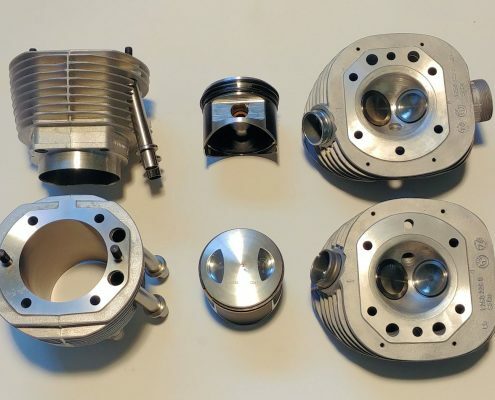 Siebenrock have been delivering high quality 1000cc upgrade kits for many years and cover just about every airhead model there is. The secret behind their popularity is the fact that they are truely bolt-on. 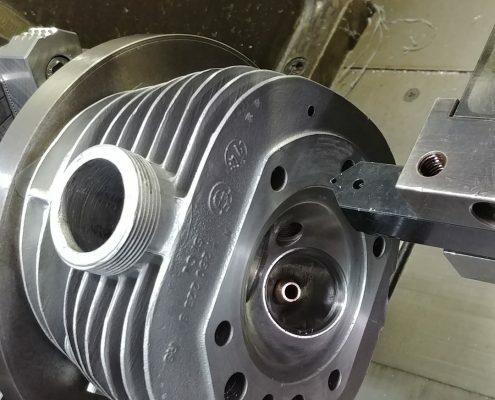 However, there is a compromise in making this so: While the Powerkit cylinders are true 1000cc items, the pistons are not. 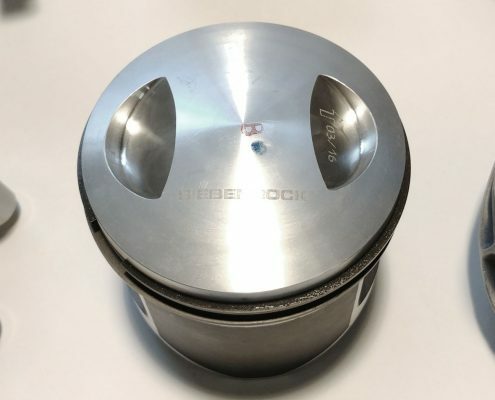 In order to fit both the larger 94 bore diameter of the 1000cc cylinders and the smaller combustion chamber of your R75, R90 or R80 heads, the Siebenrock pistons have been designed with a step to prevent collision with the heads. 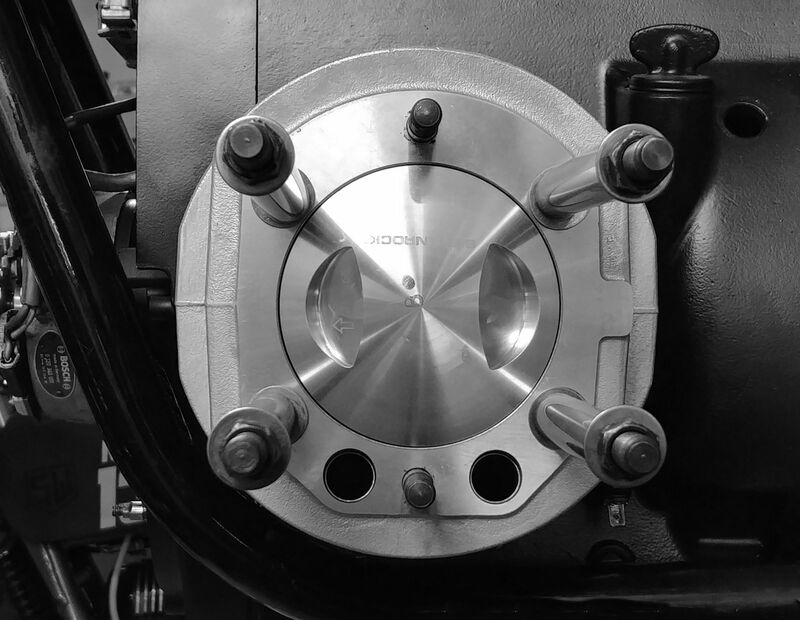 This step upsets the all-important ‘squish’ band of the combustion chamber resulting in reduced combustion efficiency and power than a true R100 setup. The problem is illustrated in the following diagram. Figure 1 shows the flat squish band design of R75’s, R90’s (and the first R100 models up to 1979) and figure 3. shows the later angled squish design that was used from 1979 in R80’s and R100’s. 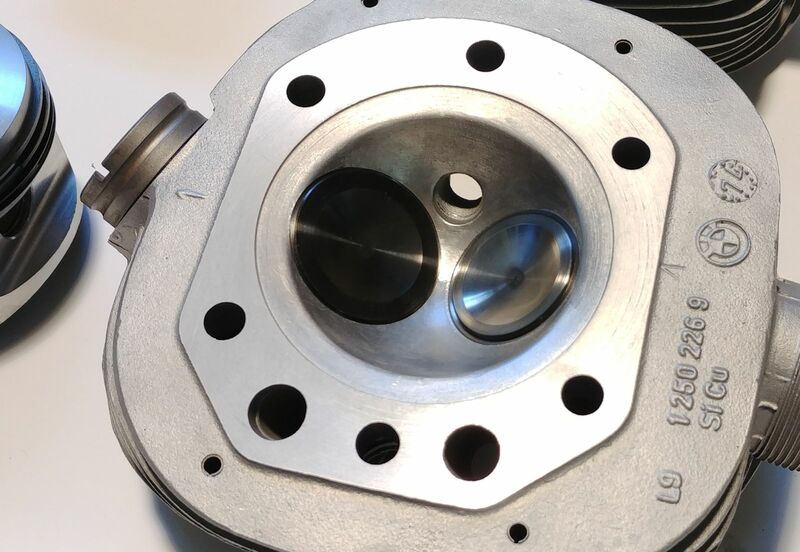 In both cases, you can see how there is a clear path for mixture to be ‘squished’ to the center of the combustion chamber creating the turbulence necessary for a more complete combustion process. The later angled squish band does a better job at this than the earlier flat squish band. Contrast this with figure 2. 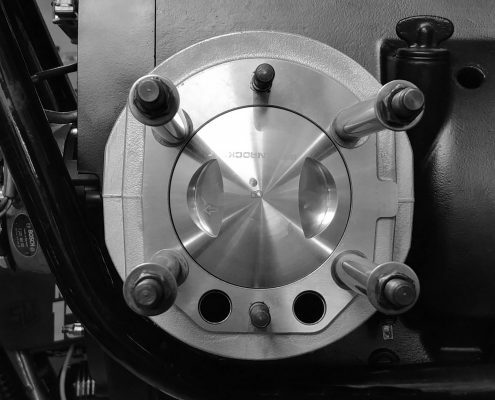 The step in the piston interrupts the path for fuel mixture to efficiently make its way to where it can more completely ignite and make more power. 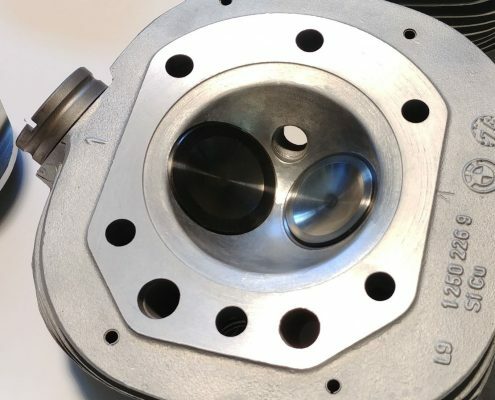 Skrunkwerks overcomes this limitation by machining your flat squish band R75 and R90 heads to replicate the angled squish band and 94mm diameter combustion chamber of later heads per figure 3. 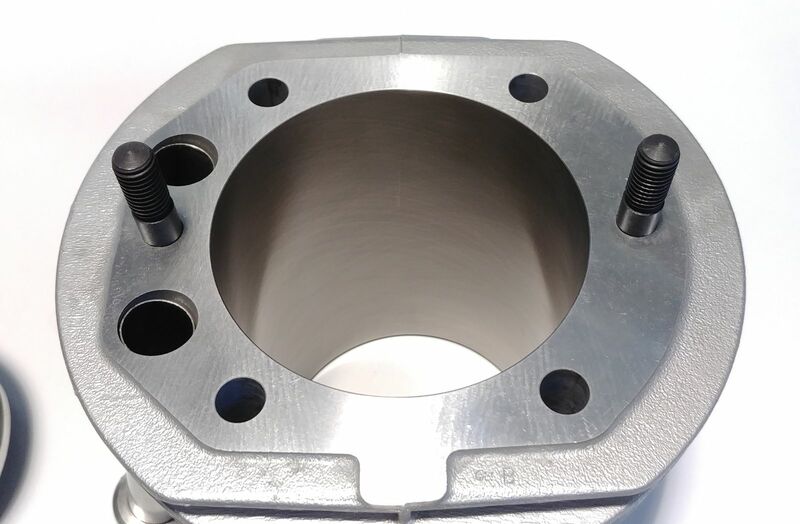 (R80’s already have an angled squish band, so the diameter of the band is machined out to the 1000cc spec). 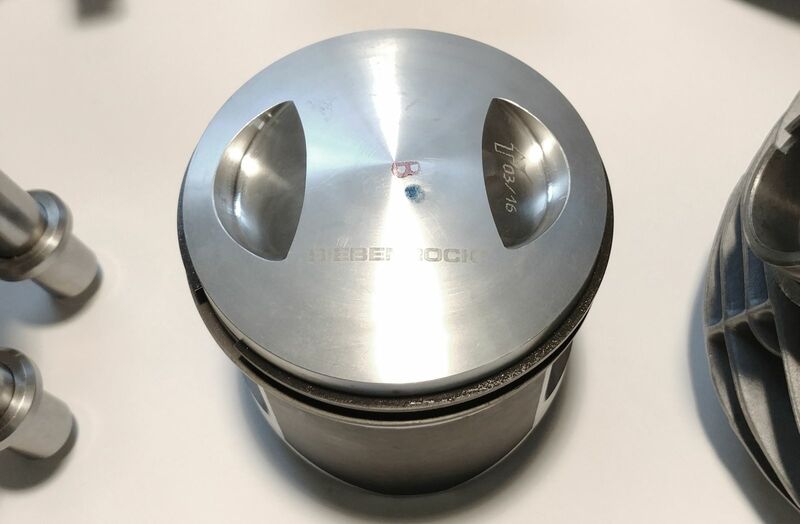 We have arranged with Siebenrock to supply kits with non-stepped pistons to suit your modified heads and 1000cc cylinders to suit earlier engine cases creating a true R100 configuration that is in fact more efficient than the stock R100 due to the use of 9.5 CR pistons. Throw in a higher lift Skrunkwerks dual pattern performance cam regrind and you won’t recognise your bike! 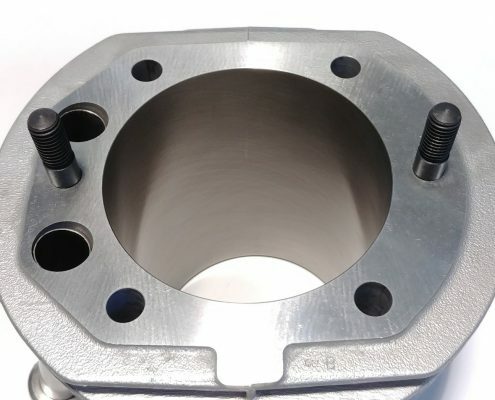 You send us your R75, R90 or R80 heads, we machine them to later R100 specifications with angled squishband accurately matched to Siebenrock 1000cc pistons. Includes cleaning, bead blasting and checking the heads. 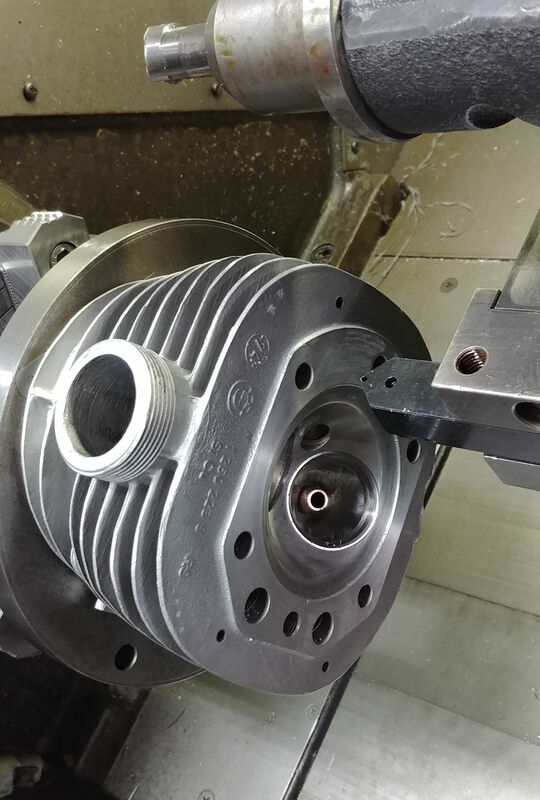 Flycutting head mating surfaces to optimise squish band thickness and ensure a true compression ratio of 9.5 with Siebenrock pistons. 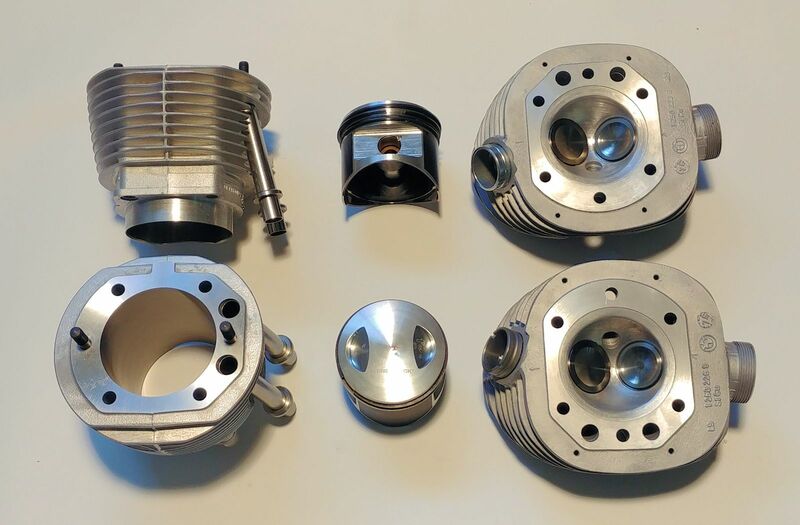 Special Siebenrock 1000cc power kit to suit the above including 2 x Nikasil 1000cc cylinders with stainless steel pushrod tubes, forged 150g lighter than stock high compression pistons, pins and rings. Also talk to us about having your cam reground to the Skrunkwerks performance street profile while we’re at it..
A pair of R90 heads. The left one is stock with flat squish band. 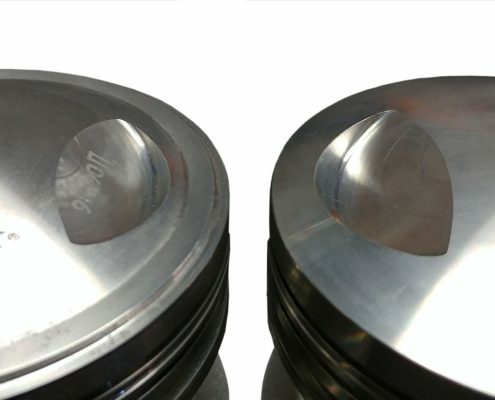 Its sibling on the right has been machined out to 94mm diameter with sloping squish band to suit the high compression Siebenrock piston – a true 1000cc upgrade! 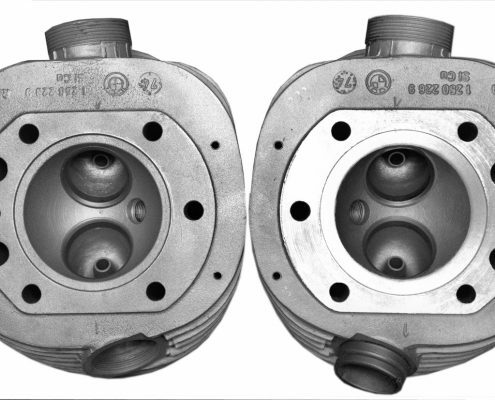 On the left is the Siebenrock stepped piston as supplied with the standard Siebenrock ‘bolt-on power upgrade kits. 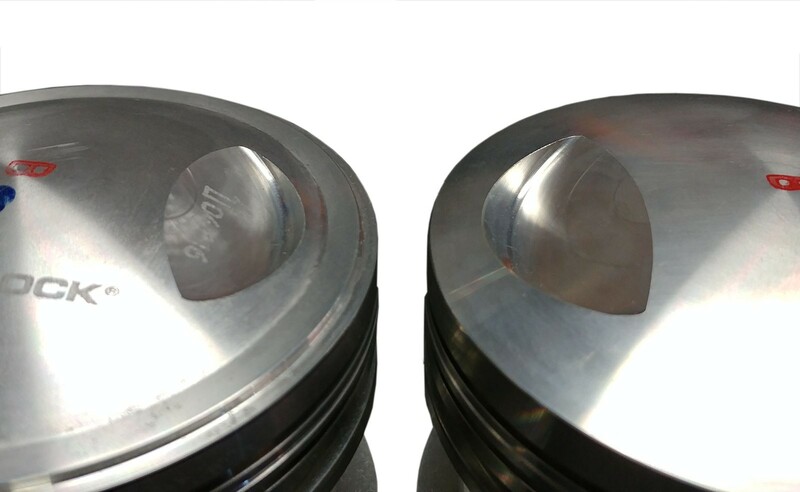 Machining R75, R90 and R80 heads allow the use of the high compression piston on the right resulting in a true 1000cc upgrade.